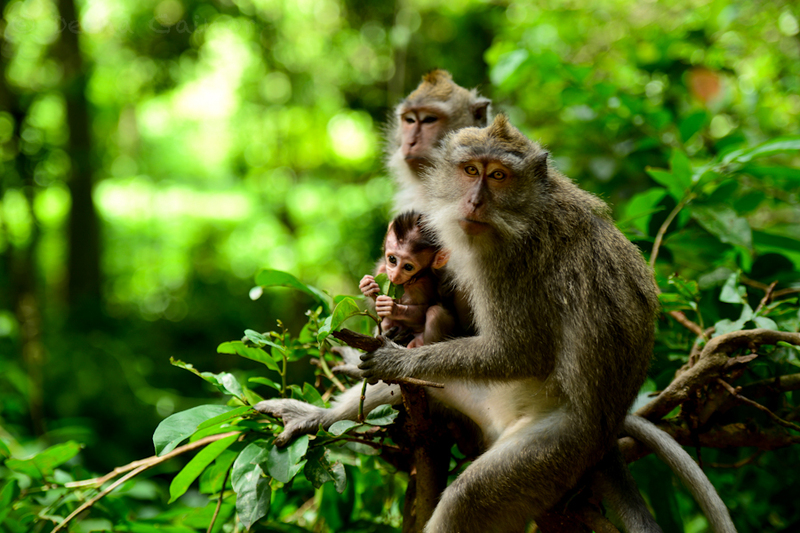 We had a blast visiting the Sacred Monkey Forest, where tons of Macaques Monkeys reside. Before we even set foot into the forest, we were thrilled to see these playful creatures, running, jumping, swinging, and playing with each other. But…we weren’t fooled. We had done enough research to know they could also be somewhat sneaky (aka “little pickpockets”) as well as dangerous, scratching and biting at will. That said, we warned the children to keep everything in our vehicle and take only what they absolutely needed. We’ve heard of people losing their cameras, wallets, and even sunglasses, so we didn’t want to take any chances. Of course, I had to bring my camera, but I guarded it carefully. We also warned the kids to not feed the monkeys any bananas. 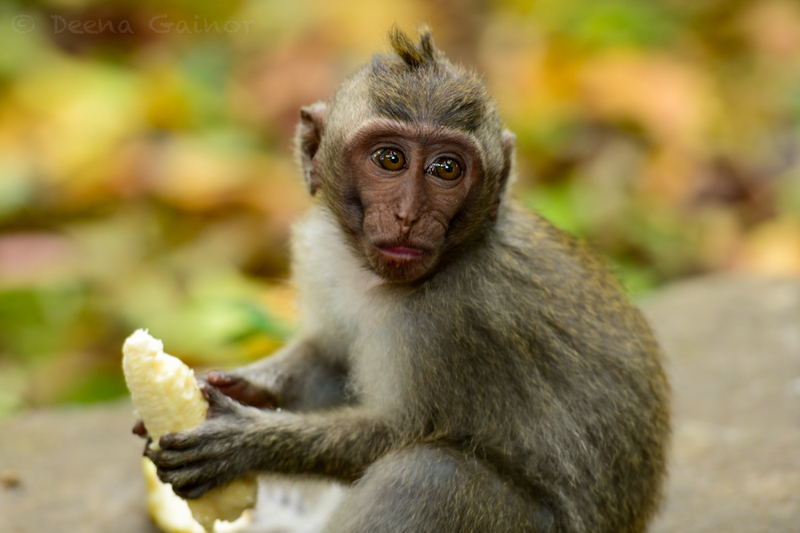 Unfortunately, the monkeys here are so used to people feeding them bananas, that they’ve become quite aggressive. How is this good for anyone, except perhaps the vendors selling the bananas. We just don’t agree with this, and think the long term consequences to both the wildlife as well as visitors are sad indeed. Not once, but many times, we observed monkeys jumping on people, trying to grab the bananas or other items out of their hands. At times, they looked like they were biting and scratching to get what they wanted. It was not a comfortable feeling. We tried to distance ourselves from people doing this, so we could just stand back and observe the monkeys from a distance, watching them interact with each other and the beautiful forest surrounding them. I have to admit, our favorites were watching the moms and their babies, either snuggling, nursing, or playing with each other. They’re quite beautiful, I must say! Some of them got a bit too close to us, as we sat down to take a rest. The babies actually climbed onto our laps to snuggle with us! Kathryn’s lap was most visited, as she is truly an animal lover, and perhaps they sensed this? Or maybe it had something to do with the fact that she had picked up a discarded banana! Uh oh. We had only mentioned not buying bananas to feed the monkeys but had neglected to tell them to NOT feed the monkeys under any circumstances. Well, all went well for a while. The babies were extremely precious and would just snuggle right in. We were amazed by how comfortable they felt doing this, as generally the moms and babies seemed to keep their distance. We just sat still and tried to enjoy the moment, but I have to be honest…I was wary and watching the adults carefully, ready to intervene, if necessary. All of a sudden, there were angry cries from some of the adults. I don’t know what happened or what changed, but the next thing we knew, there were several large adult monkeys charging us. 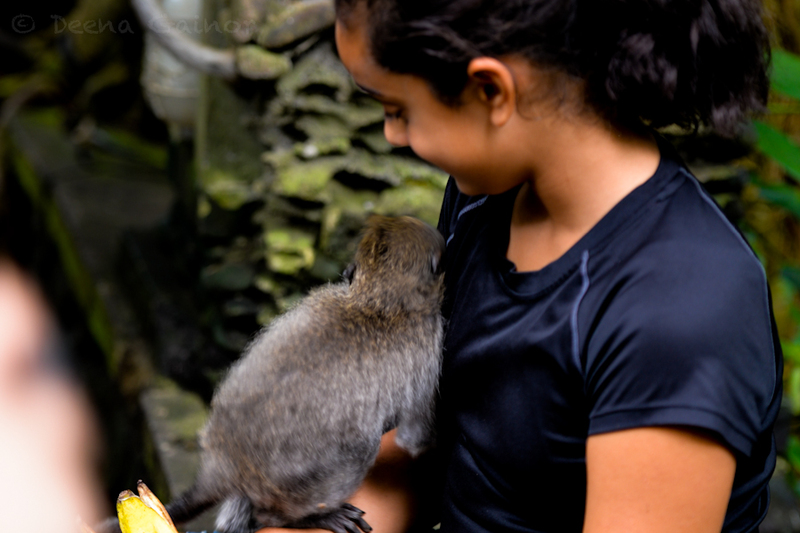 The baby seated on Katie’s lap was snatched away, and one of the monkeys actually scratched Katie’s arm. I quickly extracted Kathryn and we walked away slowly, but not before turning and looking at these adult monkeys. They were sitting there, hissing at us! It was the creepiest feeling. We immediately took Katie away and to the medical clinic, located right outside of the Monkey Forest, as the monkey had broken skin and drawn blood. The health professional thoroughly cleaned her wound and bound her arm in bandages, and we were then free to go. He reassured us that the monkeys had no diseases, but you are always concerned about the possibilities. Despite this occurrence, however, we really did enjoy our time. 1. Do not feed the monkeys anything! 2. Do not bring anything with you that you are not prepared to lose. That includes things inside your pockets, as monkeys have been known to pickpocket. 3. Bring insect repellant. The mosquitos there were terrible and huge. 4. Keep your distance. We never approach the wildlife, but only allow them to approach us if they feel comfortable. 5. If you are bitten or scratched, seek medical attention right away, so the wound can be cleansed properly and protected. 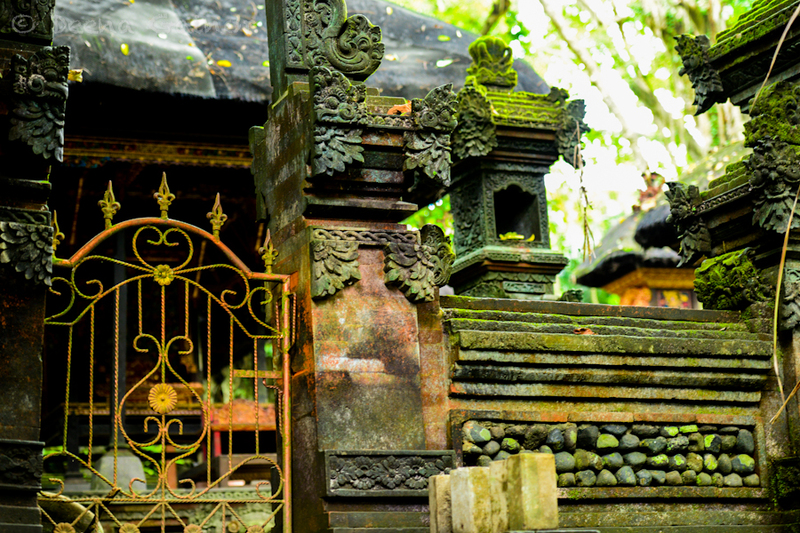 And last but not least, enjoy the Sacred Monkey Forest. Despite all of the above, it truly is a neat experience to visit the monkeys in their native environment and observe their behavior. Just do it wisely. 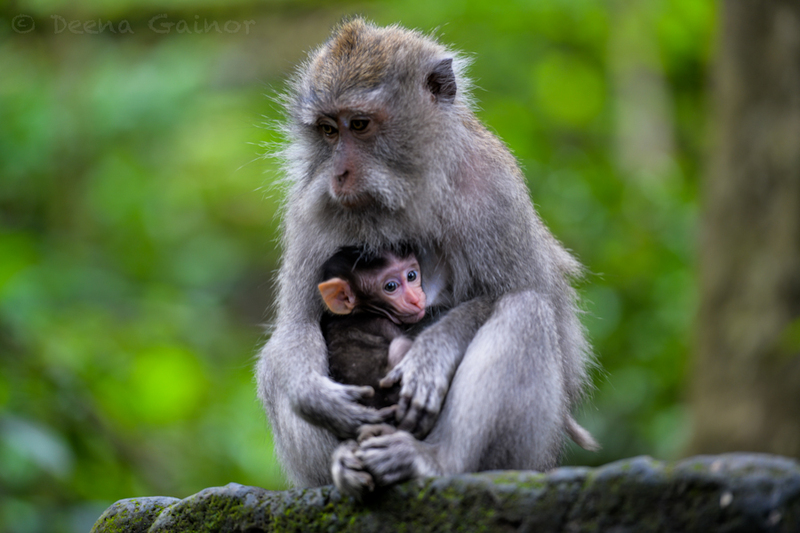 Great advice if you visit the monkey forest don’t feed the monkeys, funny that there is a clinic right outside to get your scratches treated… safe travels a flash packers guide. A well-used clinic, I’m sure! But it’s definitely worth the visit. Just WoW!! ….what a wonderful experience! Prayers for the quick and safe healing of the scratches. Love the Gainors…. 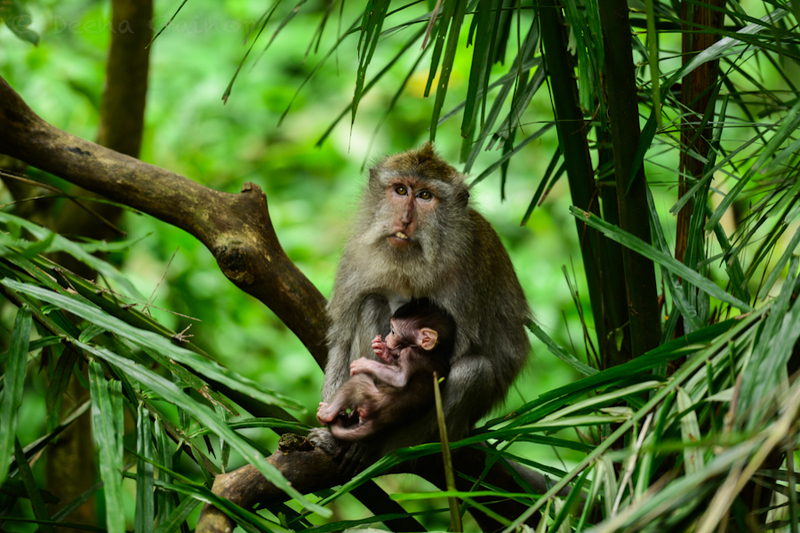 I have been to Bali 15 times and last December finally decided I should go to the monkey forest as we were staying in Ubud. We had been to Uluwatu a couple of days before and had to wait for the monkeys to leave near us to get past some areas etc… They were very sneaky there chasing us, made us very nervous. Unfortunately when I got to the monkey forest we had people walking out telling us about 2 families they seen people get scratched or bitten and I decided to steer clear of it once near the entrance. Your photos are beautiful! I am so glad you toughed it out and went to the experience, I really would love to. Wow…Bali 15 times! That’s pretty incredible. You must really love it there. I can definitely understand your hesitation. It’s a lot more intimidating than people realize. It’s easy to view the experience like going to a zoo, but it’s really not and when you see the monkeys in attack mode, you definitely want to high tail it out of there! Hope you get to experience it some day though. Thanks for the kind words.